Find out about the Additional Burial Ground (ABG) and who is buried there. Search for people by entering a name into the Search box at the top of the screen. Clicking on Categories on the right may help you find people in your area of interest. Tags have been added to the profiles of people for whom we have done additional research and as resources allow we will add tags to more of the profiles. 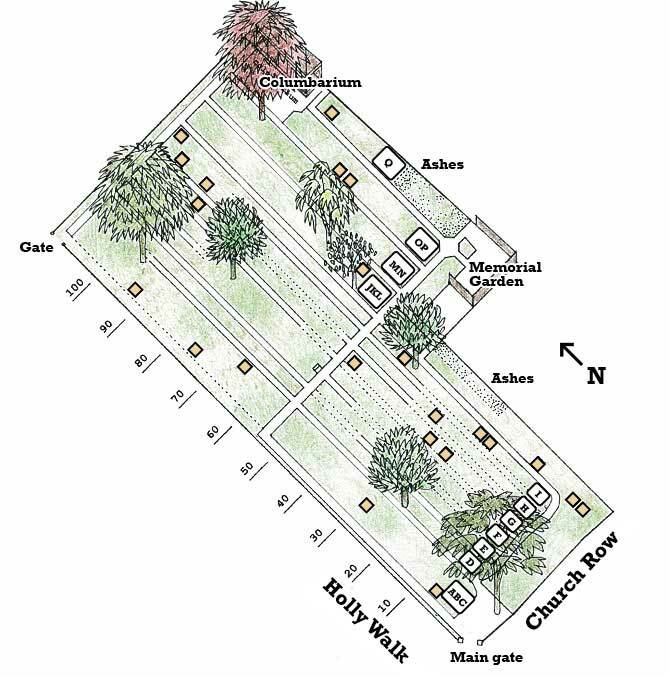 The plan below shows how the graves are arranged. If you use your mouse to hover over it you can see the location of the graves of the first group of people for whom we have done additional research. This may help you locate the grave you are looking for. Illustrator. She was the daughter of E Shepard, who illustrated the Winnie the Pooh stories, and was herself the illustrator of Mary Poppins. Artist and illustrator. Created the popular Johnny Crow books for children and illustrated many nursery rhyme books. Wartime naval officer/ bomb disposal specialist. Rat Catcher and Pearly King. Author and poet, writer of children’s books and, with her brother Herbert, of musical plays and revues. Policeman and Engineer officer in WW1. Surgeon from Manchester and body snatcher. Mechanical engineer and naval architect. Poet, famous for being the first cookery writer for ordinary families. Spice merchant; Rifles officer in WW1. Irish poet and dramatist, best remembered for The Little Waves of Breffny, and a committed suffragette, social worker and labour activist. Actor on stage and film. Scientist who had a varied and interesting career in science and commerce. The area of the original 13th century churchyard was extended in 1750 to increase the size of the burial ground. But, by 1811, it was so full that a 2 acre field across the road from the church was bought at a cost of 2,000 guineas (£2,100). This was consecrated for further burials in 1812. (Part of the purchase price was offset by selling the upper part of the field for housing development – now Prospect Place – completed in 1814.). Although the ABG is now full, it is still used to inter ashes and these people are commemorated in the columbarium and the memorial garden. 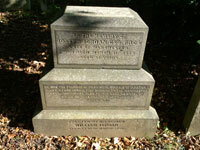 Earlier surveys – Several surveys have been done of the Additional Burial Ground. The first known one was done in 1881 by James Millward, father of the Headmaster of Hampstead Parochial School, and the most recent by the Camden History Society between 1976 and 1984. Details of the Camden History Society survey are in their publication ‘Buried in Hampstead’ published in 1986, which is available from Hampstead Parish Church. What we have done – Based on the Camden History Society survey and our own research we have compiled a database of 250 people buried (or commemorated) in this historic graveyard, which we will be adding to as time and resources allow. We did further research on 22 of the people in order to supplement the educational resources.